Quote attributed to Eric Liddell, Scottish runner immortalized in the movie Chariots of Fire. 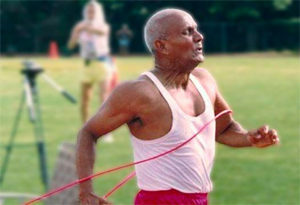 Spiritual master and world-class runner, Sri Chinmoy, could easily have said the same. Both of these incredible individuals emphasized exceeding yourself, not beating another competitor. They valued competition for the camaraderie it engenders, not to create winners and losers. To both of them, every competitor wins when he or she feels the pure joy of self-transcendence and the pleasure of connection with the Divine. 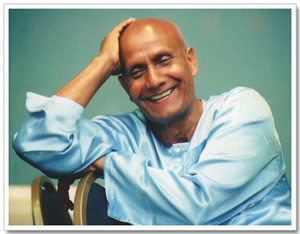 How do we become self-transcenders like Chinmoy? And how do we unleash that potential in order to reach the ultimate joy to which Chinmoy and so many great masters of wisdom have pointed? Spiritual practices abound for achieving heightened states of awareness. My personal experience is that a burning desire for contact with Spirit and a yearning for union with the Divine are important pre-requisites for living a wholehearted, self-transcending life whose pervading flavor is joy. Grasping after sensational experiences is a superficial path that does not result in permanent growth. However, peak experiences are both natural and healthy when they emerge from a grounded ego structure. Some of the methods that have been employed for centuries include: ethical training, stabilization of the attention, emotional transformation, motivation beyond deficiency needs, perceptual refinement, and cultivation of wisdom. Our goal, then, is to create a balanced foundation in body, mind, and spirit so that we fulfill Sri Chinmoy’s example of dedicated self-transcenders who daily embrace a perspective of exuberant fullness.